No programming required. (Not even a little bit.) Designed for people who want HTML forms without learning HTML. Try us out before you spend hours banging your head on your keyboard because you can't get it to work. You have more important things to do with your time. If you have any questions, check out our Frequently Asked Questions page, or Contact Us. We highly recommend your service." "I'm now making more money with less time." "Exactly what we need for our business to hit high gear." "Very comfortable to work with, even for non-technical persons such as myself." No HTML or programming required. 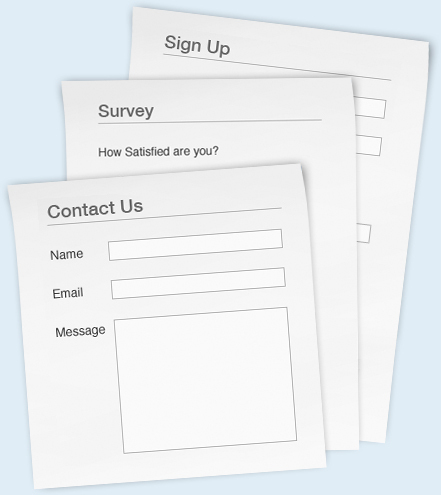 Create your form using our easy-to-use GUI form builder. Instantly receive notifications of new form submissions via Email or SMS. Auto-responder to automatically respond to form submissions for you. Manage form submissions online using our webinterface. Download form submissions as an Excel spreadsheet.